Michael Wolff's new book, "The Fire and the Fury," is rocking the Trump White House, and it hasn't even been released yet. 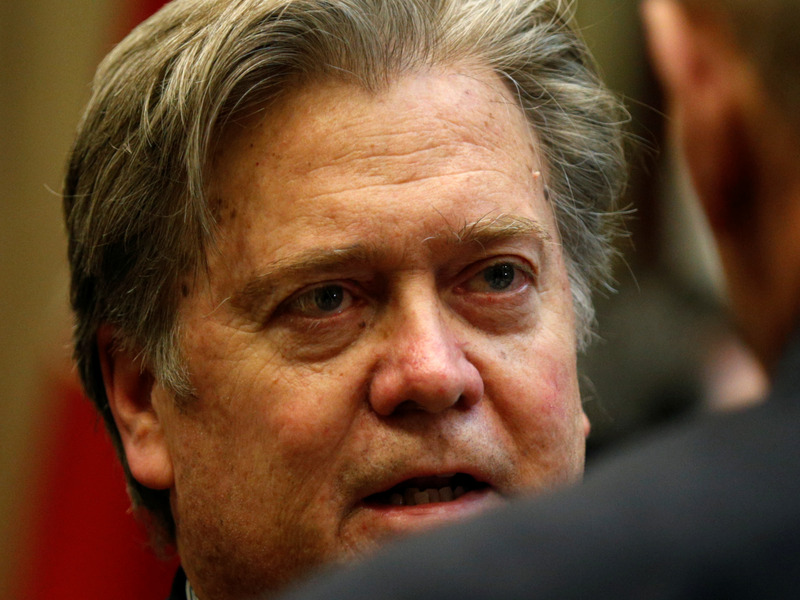 It has the president turning on former adviser Steve Bannon. This is in part because Bannon helped Wolff gain incredible access to the White House. Why? Add this to the long list of ego-driven media mistakes made by this administration â" and a costly one at that. What Bannon didn't count on was that Wolff isn't a soldier in his army. I feel like I write this all the time, but the White House is in chaos. The Trump administration is being thrown by the forthcoming publication of Michael Wolff's book "The Fire and The Fury: Inside the Trump White House." The excerpts, until now jealously guarded at select media outlets like New York Magazine and NBC for weeks, tell of a shockingly incompetent president and the in-over-their-heads aides who openly disrespect him. It is chaos, and someone let Wolff take a front seat and watch it all. That person, by all accounts, was former White House adviser Steve Bannon. While Trump may have simply known that the biographer of his idol, Rupert Murdoch, was on site, it was Bannon who ensured Wolff had access. Why? Consider it one part self-aggrandizement, another part a desire for acceptance, and wholly and completely a continuation of Bannon's desperate search for ideologica l allies. That was clear to me last August â" during what we can now call Michael Wolff's artist residency at the White House â" when I was invited to dinner with him at the Hay Adams Hotel where he stayed. I got the invitation to dinner from Alexandra Preate. After everyone gets the book, you'll know her name. In it, Wolff describes her as a "witty conservative socialite" (a fair assessment) who enjoys her champagne. Her personality is equally bubbly. Over the year and some in which she'd been working with Steve Bannon, that personality contrasted well with his dark Breitbart stars. So when Trump won, her work moved from New York City to Washington. Now, what Wolff makes clear in a small excerpt of his book that I've seen, is that Preate had a presence in the White House, but worked for Bannon. But what's harde r to do is give what she did for Bannon a name â" it ranged from general assistance with media to introductions to handling this and that important thing. There are people who do such things in various capacities and levels of importance hanging around this White House like barnacles, adding to its confusion. What they do for whom or when is unclear. Through all that chaos, though, it was Bannon who ensured that Wolff was on hand. The AP's White House reporter, Zeke Miller, said that every time he saw Wolff there it was with an "appointment" badge rather than a "press" badge. A source close to the White House says that Wolff had no handler, but ingratiated himself by saying that the White House was cooperating with book, and pointing to previous interviews he'd done. Not only did Wolff roam fairly freely, it seems; he listened rather freely, too. At dinner Preate spoke openly about Bannon's meetings and schedule, and talked about the accessability of White House Staff for future book interviews. It was comfortable and familiar. She spoke candidly about White House comings and goings. The Russia investigation was a "nothing burger" (a phrase we should surely ban) and Trump was an amazing "accidental" president. In what is current White House fashion, Preate loyally conveyed that her boss â" above others â" had the true flame of Trumpism inside of him. At Breitbart, Bannon is used to commanding a pack of ideological drones disguised as reporters, deploying them to write this or that for the good of his cause. Through Preate and through this entire process he was trying to form a version of the truth, just like he does on Breitbart and has done with films and other media in the past. The problem, though, was that Bannon was too focused on his truth to accept anoth er. Wolff is not a soldier in his army; he's a writer. And as Joan Didion said, "Writers are always selling someone out." In an effort to dismiss Wolff's book, White House press secretary Sarah Huckabee Sanders called it "tabloid gossip" and "trash" from an author that "no one has ever heard of." Wolff didn't even interview Trump, she pointed out. But of course this book isn't about Trump; it's about his White House. And there is no doubt that Steve Bannon had heard of Wolff before this book was conceived. Wolff is the part of the type of New York City media cabal both he and Trump court and manipulate while professing to detest. Wolff is establishment. Like I said, Wolff wrote a Murdoch book, and there's no faster way to make Trump happy than by putting him on the same level as his i dols. It's a very simple seduction. Bannon is a bit more complicated, but not necessarily less transparent. Leading up to the inauguration, Wolff gave Bannon a platform for his ideas beyond the Breitbart circle. Wolff is the reason Wall Street read The Hollywood Reporter last November, and cringed as Bannon described his 1930s fever dream of a money-squandering infrastructure project where America would just "throw it up against a wall and see if it sticks." We've seen Bannon go open kimono for presumed ideological allies before too. Perhaps you'll recall his interview with Robert Kuttner at The American Prospect last August. The one where he bragged about his power in the White House and called for economic war with China. It's part of what got him fired. Bannon reached out to Kuttner because Kuttner shared some of his economic views on China. He thought that alone gave him and Kuttner common ground. Everything else, he thought, could be forgotten for that one cause. Bannon was desperately searching for allies then, and he needs them even more now. Wolff wore a guest badge because, as far as Bannon was concerned, he wasn't the press; he was an ally. Bannon extended the Medici-like relationship he has (or maybe had, according to certain reports) with the Mercers to the media in order to achieve his political ends. He was commissioning media for the Trump administration the way an Austrian nobleman might commission a symphony in C.
And yes, this was also for Bannon's own aggrandizement. He's been criticized for that in this White House â" a pristine example of a dozen pots calling a kettle black. That seems pretty clear in Wolff's book, at least from what I've read.